Kat at Just Crafty Enough has been doing this amazing series of holiday ornaments for the 24 weeks leading up to December 1 — seriously, I don’t know how anyone can plan that far ahead — as part of an Advent calendar project. The whole series is worth a browse if you’re into traditional Christmas crafts from around the world, but the most recent one caught my eye that is a knit elf. 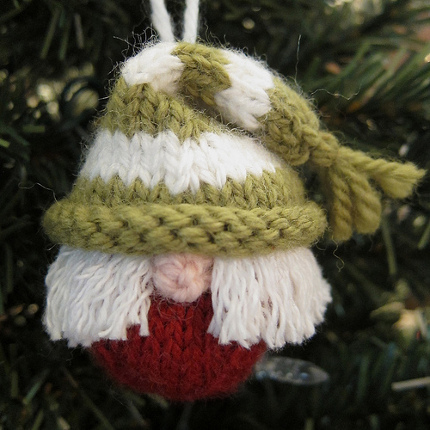 It’s a ball-shaped ornament that looks like a dwarf type elf more than the traditional Santa elf, but it’s totally cute and a quick, pretty easy scarp project, too. She works it on double points, with the body worked in one color and a two-color hat. It’s so cute you might want to make several. They’d be awesome little decorations for gift bags, too. Thanks Sarah, glad you like him!